Today’s business leaders and employees are driving the business need for BYOD, we know that. As always, network security and preventing security breaches remains a top concern as organizations want to keep their corporate data inside and secure. SearchConsumerization.com in conjunction with industry expert and thought leader Zeus Kerravala surveyed our Networking and Security audience to gain further insight into this emerging market and better understand current IT priorities and trends. In addition to buyer insights, the below Infographic provides helpful tips to maximize your marketing effectiveness with these buyers today. Aside from a major hardware failure, websites going down or the inability to get into email (the tech crisis I think our IT department dreads the most), I’d never really put much thought into how a tech project comes to be. That is, until I met Kevin Stokes and Randall Gamby. Kevin, CIO for the town of Brookline, and Randall, Information Security Officer for the Medicaid Information Service Center of New York, came to our offices literally just to chat with our sales force about how they do what they do. One of the topics they covered was the origin of the technology project. I found it very interesting, particularly as a marketer responsible for helping technology marketers improve the effectiveness of their content marketing efforts. What I’d never really thought of prior to this discussion, is how the classification structure IT departments use to categorize the types of technology projects they’re handling, can actually inform and prioritize the focus of your content. Some of you may be asking “what’s a classification structure”- don’t worry, I did too. Basically, IT departments look at tech projects in certain ‘buckets’ which dictate everything from how they research, to the prioritization of the efforts. Something Broke– I think we’re all familiar with this one. When a something goes down, it’s a scramble to fix the problem. There may be some research here, but it will be quick, and right to the point. These projects are typically priority one on any given day. The Upgrade– Another area technology teams monitor are upgrades for the various hardware and software products the organization leverages. These can be either mandatory or optional, with the research process here being one that starts basically when your marketing does. IT teams follow the news around the upgrades, explore the pros and cons, and work to understand what it’s going to look like for their organization, sometimes well in advance of when they’ll plan to actually deploy. New Features– Thanks to business owners like us marketers, there’s often a demand on IT for a new functionality or feature of an existing system to support and overall goal or new strategy. Sometimes, these projects actually originate within IT as the anticipatory result of a business focus. These projects typically result in a tech purchase, managed by IT (hot button topic business vs. IT, we’ll circle back to that one in a future post but in the meantime, that link will take you to a great paper on the subject). Strategic Endeavors– Some organizations may put an emphasis on what I’ll call ‘strategic IT.’ Based on the overall direction of the business, technology needs may be evolving. It may be a ‘right now’ thing or maybe it’s a ‘3-5 year’ thing- in either case, Sr. IT is often monitoring the landscape for the right strategic investment. Randall mentioned spending as much as 30% of his time simply researching/monitoring the technology landscape. Crisis Management– whatever the solution, it’s always important to understand what happens when the unexpected happens. Make sure your buying teams have access to information on how ‘easy’ it is to get the product or service back up and running in the event of an emergency. This content will work particularly well with your In-the-trenches team members who will ultimately manage the product in the enterprise. They’re also typically the ones responsible for researching the project, so this could give you a leg up. Play up the ‘minimal business impact’ when marketing to your more senior or strategic personas (line-of-business (LOB) or Sr. IT- side bar, for a little bit more on what matters to these guys to inform your persona, check out this post & infographic). Navigating the Upgrade– while it’s important to publish content yourself on how amazing the new version is, you’re not exactly the most credible source out there (I know, the truth hurts). The reality is independent content can do wonders here for you (The CMO Council and Netline had some interesting research here recently). Build a strong alignment with relevant 3rd party content and integrate custom content into your plans. Bells and Whistles– this might seem like and obvious one on the surface, but the reality is ‘bells and whistles’ mean different things to different people. Make sure you’re producing content that covers what matters to each of the project’s influencers. Your personas will be critical here. What the business cares about, will differ from Sr. IT, which will differ even further from line-of-staff IT. Position the benefits to each persona, and distribute the content accordingly. Forward Thinking– Finally, build out the content that speaks to how your solution enables the tomorrow infrastructure. Look mainly to target your more senior personas with these messages and be sure to align them with more wide-reaching, relevant publications, relevant groups or communities, and conferences, to intercept researchers tasked with thinking about the IT of tomorrow within their organization. Some of these themes will likely emerge as you lay out your personas if you haven’t already. If you’re in the process of working through personas, remember to focus on things like common pain points and priorities in addition to role or level within an organization. As a thorough content marketer, obviously I didn’t let this interview slip away without capitalizing on the content – so if you’re interested in checking out this portion of the interview, you can read it here, or view it here. In a word – “pragmatic”. While the current technology evolution has media outlets like TechTarget filled with discussions on cloud computing, big data, and mobility/BYOD, CIOs state their top concerns revolve around risk management, virtualization, and the health of their networking infrastructure. In fact, fewer than 1 in 5 CIOs surveyed said they had a ‘cloud first’ mentality – opting to use cloud solutions whenever possible. Most CIOs, 3 out of 5, described their approach to cloud computing as ‘pragmatic’ – considering cloud alternatives where it makes sense. They’re also pragmatic about their suppliers – with some 35% saying they will consider new suppliers for every significant purchase, while 65% say they will consider new suppliers only when their current suppliers cannot fulfill their needs. 1. Keep discussions strategic. Talk about how your solution works today, and describe how you think it will fit in 3 years into the future given the current trends in technology. CIO’s refer to this as “helping me see around corners”. They expect that you have the same planning horizon as them. 2. Tactical discussions should include how use of your solution will improve operating margins, reducing operating or materials costs, or increasing top-line revenue. This is how the CIO is going to have to discuss your product with their peers. 3. Be available. Make sure your products and solutions can be found by CIOs and their teams by advertising to active researchers on the most appropriate TechTarget community for your technology. Our annual APAC IT Buyer’s Survey is one of the most popular pieces of research we produce. 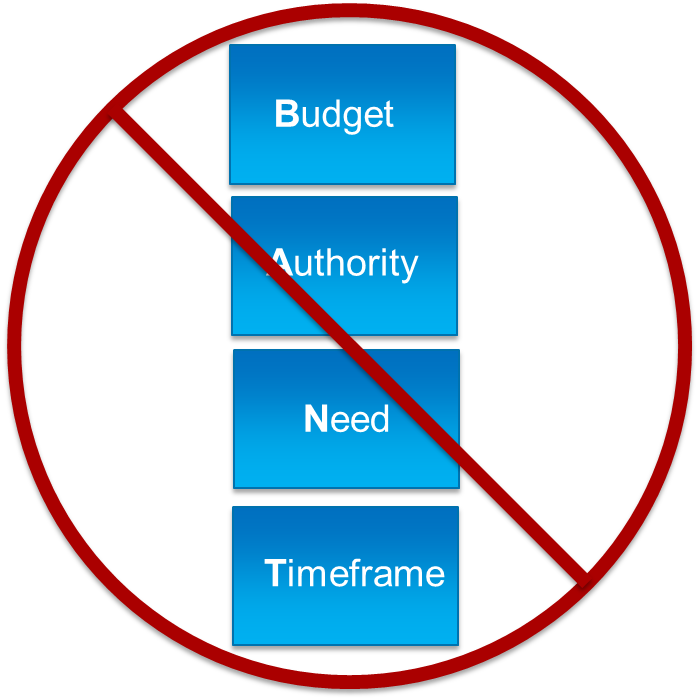 BANT (Budget, Authority, Need, Timeline) is an unreliable barometer for qualifying a sales opportunity. Why? Budgets and timelines shift over the course of the research journey. Purchasing authority is seldom centralized with a single individual. In most cases, a team of researchers evaluate vendors and solutions. Often, the technology specialists can veto buying from a provider they dislike. you about their companies’ purchasing plans. Marketers need to maintain a strong media mix “right sizing” their investments in online campaigns and offline events to effectively influence buyer. online research start to carry significant weight in the overall buying process. assets prior to making a purchase. or specifying solutions and vendors. 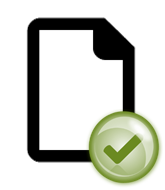 Whitepapers are widely viewed as useful content in supporting technology purchases. Most whitepaper downloads occur when a project is planned or as the company is building its business case. Relevancy trumps brand familiarity when it comes to determining whether to read a whitepaper. Most have downloaded a paper from a vendor they did not know because the content related to a current project. Few buyers want to receive a call immediately following a single download. Instead, they prefer to be introduced to additional content before feeling comfortable with a direct engagement with the vendor. I’d be happy to review the results in greater detail with you. Feel free to shoot me an e-mail if you’d like to set up time to speak.ot know because the content related to a current project. In the world of digital marketing, the popularity of microsites constantly fluctuates. In the early 2000’s they were wildly popular; specifically with B2C organizations. Since that time, they have dipped in popularity and some people have suggested that microsites are dead or offer little value. In the B2B world, where the sales process is complex and arduous, microsites have proven to be powerful tools to help capture, engage, and convert prospects to leads. 1. Microsites are Targeting Tools – Microsites help you communicate better with your prospects through targeting. As a B2B technology marketer, I surf through countless parent brand websites. Many large organizations struggle to make relevant content easy to find. Microsites simplify the user experience by making content available that helps solve problems while eliminating distracting corporate information. This type of user experience offers end users the most relevant, targeted content. As found in this DemandGen Buyer Behavior one of the most common pain points for buyers is finding content targeted to their industry (persona based content). Personal driven microsites get the most relevant content in front of your prospects and ultimate allows for better conversations. The Impact: On average, when we build sites with a persona strategy we see a 200% increase in content click rates and a 170% higher social share rate than sites without. 2. Elevate your Brand – As marketers, we have many goals; driving awareness, demand generation, social presence, generating revenue, etc. First and foremost, microsites are a powerful way to lift brand awareness and enhance perceptions.Compared to parent sites, highly focused content of microsites offer better, deeper connection with visitors. The Impact: At TechTarget we run 20+ microsites for our customers at any given point. To monitor the performance and measure results, we use a 3rd party to survey prospects exposed and not exposed to specific microsites. Results show that users exposed to microsites have a 7.5 % higher likelihood to recommend, 9% increase in brand consideration, and 13.6% increase in message association. Bottom line: Microsite move metrics that matter. Need more? Check out this published report on online ad effectiveness performance. 3. Reporting – As a marketer, I’m required to analyze massive amounts of data to prove campaign success. Microsites offer sophisticated, comprehensive data metrics that help effectively optimize performance and ultimately showcase front end ROI. ites are a great place to run A/B tests. We recently conducted A/B testing on registration pages within a microsite and saw a 275% increase in conversion rates for in target leads. 4. They are Easy, Fast, and Flexible to build – Internal projects that require web developer support tend to be difficult to launch and difficult to optimize. Using a microsite (especially with a partner) is a great way to help speed deployment and ease internal workload strains. A partner can help make microsite creation turn-key, deliver rapid deployments, save internal resources, and be more cost effective. Using a partner that produces a high volume of microsites will give you experience you can trust, and simplify the process from start to finish. The Impact: At TechTarget we are running 20+ microsites at any given point. We have the expertise to build these quickly, and the resources and tools dedicated to do this in a cost effective manner. I have seen clients try to take these projects on themselves and build times be 6+ months, I have also seen our microsites be spec’d out and built to achieve specific goals successfully in less than 2 months. 5. Place to house social media and user generated content – As Lynne Capozzi says, “user generated content needs a home…at the end of the day, user-generated, social content is fundamentally scattered. Microsites give UGC a home and helps put it to work within an integrated digital marketing plan”. With a microsite you can create units to house multiple social media feeds, as well as easily allow users to share what they view and encourage viral growth. The Impact: Many of the TechTarget microsites are enabled with Social tools. For example, one of our vendor’s social shares rates on the microsite 9x above average. The focus and community element of the site led to huge social sharing rates. Parting Thoughts: If you need a fast to deploy, easy to optimize marketing tool, microsites should be high on the consideration list. The segmentation, content housing capabilities, and brand exposure are proven to elevate brand values. Have you considered adding a microsite to your marketing strategy yet? In the B2B marketing realm, we’re hearing more and more about the shift of control from the seller to the buyer when it comes to conducting research. 67% of the buy cycle is completed online according to Sirius Decisions, thanks to the proliferation of content, and immediate access to peers afforded by social platforms. As a result, marketer’s are feeling the pressure to create more content, and leverage more outlets to promote it- according to the Content Marketing Institute and MarketingProfs, the use of all marketing tactics, with the exception of print, is up. But, how do you know it’s really necessary? What does that research process really look like and how do you know when is the right time to reach out to your prospects? With the recent release of our IT Deal Alert™ product suite, and thanks to the insights of our Activity Intelligence™ platform, we were actually able to see the research process of a real, caller qualified enterprise technology project. We took a look at all the activity on our network, leading up to the day the project was qualified to help you, as B2B technology marketers, see just how important your presence, in various capacities, throughout the buy cycle really is. For more information on this particular journey, or how you can leverage our intelligence solutions, please contact your TechTarget sales representative, or Courtney Kay- ckay@techtarget.com. Cloud backup services adoption is up- Is your marketing helping you capitalize on it? Cloud backup is one of the oldest cloud storage services around; but, it’s only in the past couple of years that it’s grown-up enough to be seriously considered by enterprises. According to TechTarget’s Storage Purchase Intentions survey conducted by SearchStorage.com, IT professionals identified that cloud backup usage is rapidly growing. Users have an average of 13 TB of data in the cloud, representing about 37% of their total backup volume. Companies are storing their primary data in the cloud, backing up everything from their laptops to their phones to their tablets. Those using it trust it, with 88% being satisfied with their cloud-based backup and 58% planning to expand the use of backup services within the coming year. While the market’s grown 71% over the past 2.5 years, 59% of those surveyed, still haven’t made the leap. The good news is, 1 out of 4 is committed to evaluating cloud backup solutions within the year. The market is still very fragmented with a lot of niche players and no clear leader. Now is the right time to amp up your marketing efforts. But, how can you adjust your marketing strategy to tap this growing market? 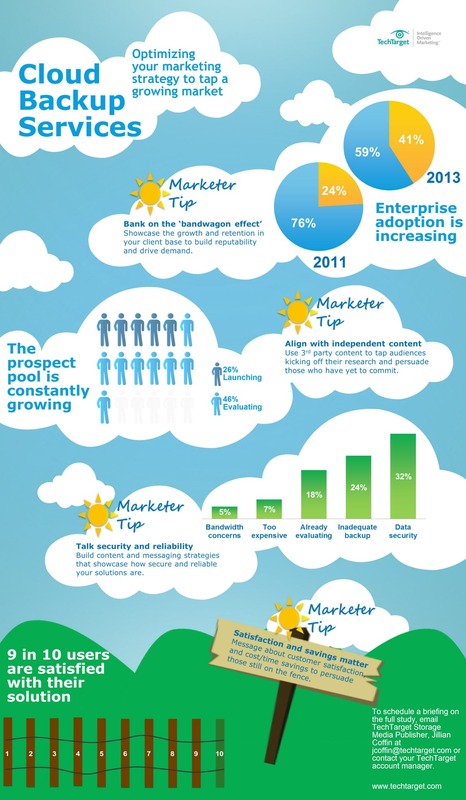 The following infographic walks through some quick and easy ways to adjust your marketing efforts to effectively tap this growing market. For more information, or to schedule a briefing on the full Storage Purchase Intentions study, please contact TechTarget Storage Publisher Jillian Coffin at jcoffin@techtarget.com. As marketers, many of us understand the value of adding webcasts (or webinars) and videos to our content marketing plans. Streaming media provides prospects with a more engaging experience than traditional white papers or other PDFs which for us marketers, means better branding and more dynamic leads. The trick about streaming however, is getting the prospects to actually show up, and when they do, stick it out. 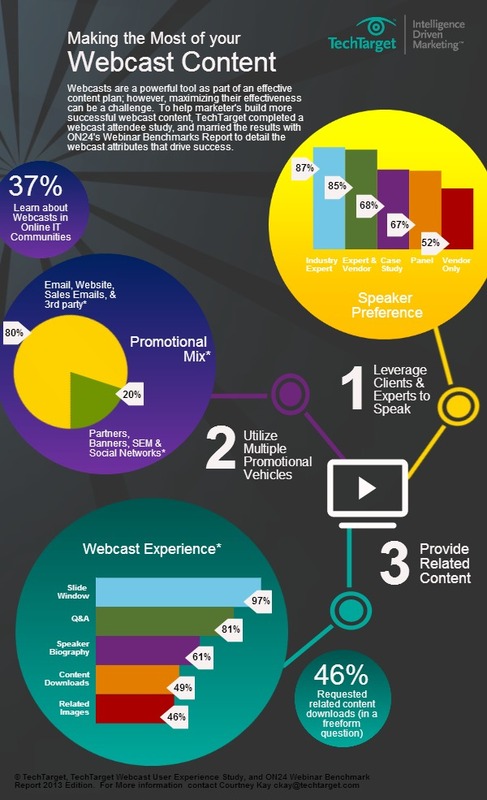 Unlike other content forms, webcasts require a real commitment from the viewer. Leveraging the findings from TechTarget’s recent Webcast User Experience Infographic, I’ll give you some quick tips to increase the effectiveness of your streaming content, showcasing some real TechTarget campaigns that benefitted from these best practice tactics. 1) Use Technical Experts. 87% of webcast downloaders indicated that they prefer a webcast with an industry expert speaking (a 167% higher likelihood of attracting a prospect). Campaign Proof Point – In a recent award winning TechTarget microsite, the two primary videos on the site were hosted by a leading industry expert and drove 76% of the overall streaming media views. The industry expert drove 15X higher views than videos and webcasts with just vendor provided speakers. 2) Diversify your Promotional Channels. While 80% of survey respondents noted finding out about webcasts through e-mail, other mediums are starting to gain traction. Plan to integrate display, partner promotion, paid search and especially social outreach in your promotional plans. Enable sharing of your event on social platforms to help turn your prospects into your marketers. Campaign Proof Point – In the same microsite example as above a well-rounded promotional strategy was utilized. By the nature of this being a microsite search elements are considered, as well as email and banners to help drive traffic. To go a step further and increase the user engagement the site offered the chance to share these webcasts and videos easily with social share buttons. This well rounded content and promotional campaign saw 12x the average social share rates. 3) Offer it On-Demand, and Fast. If, like me, you have a DVR, you might not recall the last time you watched a show during its original air time. Your prospects exhibit the same habits- Our study showed that 83% of users said they have signed up for a live webcast but then missed the live day. But, the more important point is that 76% went back to view the on-demand version. Offering an on-demand option is the best way to extend the reach, and regain otherwise lost viewers. Campaign Proof Point – We recently ran an information security webcast with a live component. The program boasted both a live goal and full campaign guarantee. By extending the webcast on-demand we were able to generate over 40% more prospects. The on-demand option fits prospects’ busy schedules and extends the reach of your streaming content. 4) Integrate Recommended Content and Next Steps. Your prospects get inundated with content, ads and offers today. The fact that he or she has committed to your streaming content is a real win, make sure you maximize that interaction by offering more relevant content and meaningful next steps. Believe it or not, that’s what your prospects are asking for. In our study we asked an open ended question of what users would improve their webcast experience. Over 40% of those that responded requested more related content be available. Today’s streaming player’s provide lots of opportunities for recommended content, and give you the opportunity to drive more engagement (and thus intelligence) from your prospects. So whether streaming media plays a large part in your overall content strategy today, or is something you are just starting to invest in and fine-tune, take these cues direct from our most frequent webcast viewers. They are looking for expert technical content, available across multiple channels, to be viewed on their schedule and with actionable next steps. 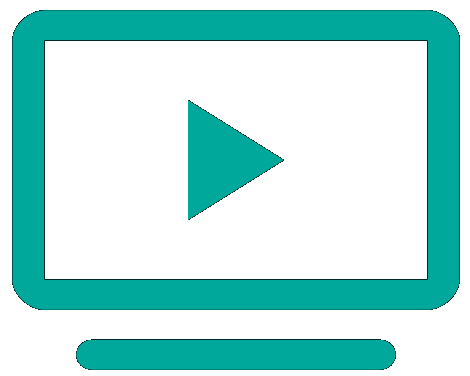 I’ve seen campaigns successfully engage key prospects with this strategy – so try implementing these tips to re-capture some of those long-forgotten viewers and get the best value out of your streaming investments. “Brands are publishers.” “Content is King.” “Traditional marketing talks at people. Content marketing talks with them.” All very true statements from thought leaders; but, for a small business (or small marketing department in a big business), how do you produce enough content, and the kind of content that engages, with limited budget, limited resources and a to-do list a mile long? Coming up on May 8th in San Francisco, I’ll be presenting a prescriptive, three step plan to building a strong content strategy, laying out clear content priorities, while maximizing your content marketing efforts and investments. Below is a quick sneak peak of the presentation. The event is complimentary to all technology marketers. You can register for the TechTarget Online ROI Summit here: http://techtargetsummit.techtarget.com/sanfrancisco/ If you’re interested in the content, but San Francisco (or the timing) are inconvenient, just reach out to me directly (ckay@techtarget.com) and we can schedule a time for an exclusive session for you and your marketing team members. While building a webcast (or webinar if you prefer) has gotten easier in terms of production, and cheaper in terms of hosting or outsourcing, it hasn’t necessarily gotten easier in terms of building good content, in fact, it might have gotten harder. Today’s content-rich landscape can make it pretty challenging to create the kind of content that really engages. To help technology marketers build better webcast content, TechTarget conducted a survey of its North American Webcast users. The following infographic highlights some of the marketer tips derived from the study’s findings. If you’re interested in a briefing on the full results, contact Theron Shreve (tshreve@TechTarget.com) TechTarget’s Director of Streaming of Media. A blog for B2B Marketers on media and market trends and what that means for building intelligence-driven marketing programs and sales follow-up.